ION Audio, the makers or iCade Arcade Cabinet for iPad, are expanding their range of iOS game controllers with 3 new accessories. 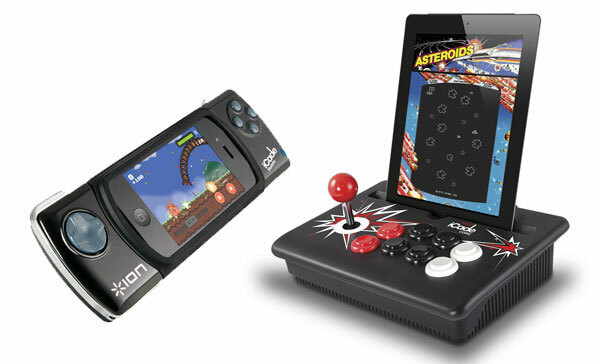 The new models are named iCade Jr., iCade Mobile & iCade Core. The iCade Mobile is designed for iPhone and iPod Touch, the iCade Jr. is a shrunk down version of the original iCade while the iCade Core is much like the original iCade cabinet and supports iPad as well as iPhone and iPod touch devices. The new devices will work with with the existing list of iCade compatible games. iCade Core – Pictured on the top right, the iCade Core offers a stripped down version of the original iCade cabinet and supports the iPad, iPhone and iPod Touch. Like the original iCade, the iCade Core lets you play your iOS games with a real joystick and buttons. Communication is done through Bluetooth, but a 30-pin connector is included to allow for charging while playing. No pricing yet for this slimmed down version. iCade Mobile – Pictured top left, the iCade Mobile is a device that wraps around the iPhone or iPod Touch to give you more of a mobile handheld gaming experience. Again, using Bluetooth alone for the communication, it offers a swiveling landscape or portrait orientation. This one will cost $79.99 when it becomes available this spring. 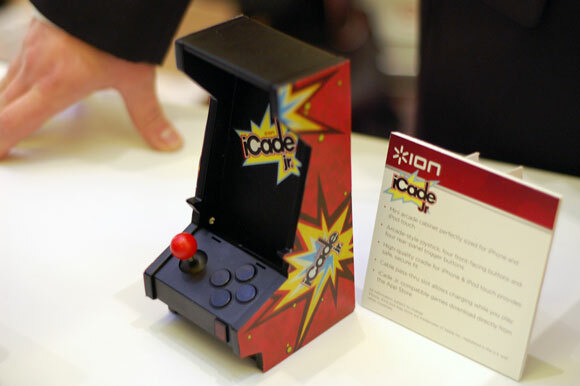 iCade Jr. – Pictured below, the iCade Jr. is a shrunk down version of the original iCade. This version is made specifically for the iPhone or iPod Touch and lets you prop up your device in this miniaturized arcade cabinet. It comes with an arcade joystick and 4 front facing buttons a 4 rear facing buttons. It also offers a dock connector for charging. This one is expected to cost $49, again coming in spring. 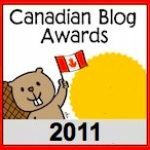 Help Vote for iPhoneinCanada.ca to Win the 2011 Canadian Blog Awards!